NOTE: Some of the pictures may be a little different than what you see. Ask for help if you need it! NOTE: You will be moving from this page to your own computer as you work. To go back and forth between two documents on your PC, use your keyboard. Hold down the key "ALT" and click the key "TAB." That will take you back and forth between two documents. Notice the icons (pictures) and words on the menu bar. They all do different things. You can play with them all you want. Go ahead and try different things. Type in some words. How can you delete (erase) them? How can you move text to different places? How can you change the size, the look, and color of your text? Let's make a title page, and you'll do it all. Now you have a blank, white screen showing. Look for the icons that show you where the text is going to be on the page. That is called "text alignment." Do you want your text to run in a line against the left, the right side or along both sides? Maybe you want it in the middle. If you don't see the little icons, click on the down-arrow in the box next to the "A" and look for it in the window that appears. 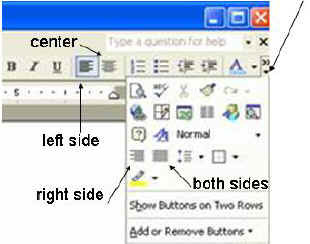 For this task, choose the center alignment option. You will see your cursor (little black text line) go to the center of the page. When you see the cursor on the center of the page, type the title you want for your document. 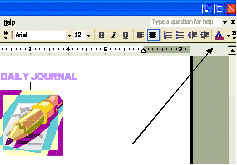 The example title was "My Daily Journal." What do you want to introduce with your page? Maybe you want an album with your short stories, or pictures of your pets, or letters to someone. If you can't think of anything, write "My Daily Journal." 'Notice that what you wrote is in the middle of the page. It should be. It's a title! Now click anywhere in you title and then click the different alignment icons. You will see your text go back and forth! Be sure to return to the middle and let's continue. Take your cursor and place it at the very beginning or end of the title. Hold the left mouse button down and drag or pull it across the words in the title. That action is called "highlighting." Once you have all of the words highlighted, let go of the mouse so it stays that way. Now go to the "Font (or lettering) Selection Box." If you don't see it on your toolbar, remember to click on the down-arrow in the box next to the "A," like you did before. Look for the Font (or lettering) Selection Box. With the words in your title highlighted, click on the down-arrow next to the box ("default font") and click on different font options. When you decide on one, click on it and go to the next step. With the text highlighted/selected, decide on the size of your text. You can also chose option for making the text bold (B) or italics (I) . In the Model, the title font was Arial, size 18, bold. Once you decide on those options, click outside of the text, anywhere on the page. You will see the effect of your changes. 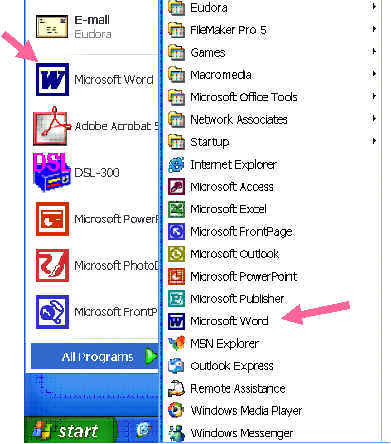 Now highlight your title words again, and this time, go to the "A" icon on your toolbar. Click on the little arrow next to the "A" and choose the color you want for your title. Click outside the title to see the changes. We are now going to insert a picture into your title page. Go to the end of the title and press "Enter" on your keyboard. Your icon should be right under the title, in the center. 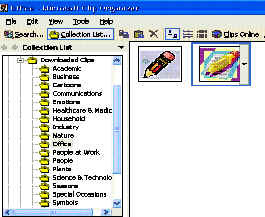 When the clipart window opens, look for the words "Clips Online." 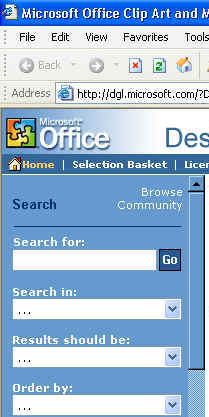 Left click that option and wait for the Microsoft site to open. You will see a few boxes on the left. They want you to type in the information. Under the "Search for" section, describe the image or the category for the image you want under your title. 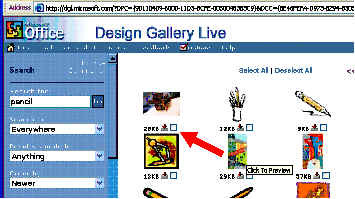 In the example, I wrote "pencil," and selected the image I liked the most. Play with different descriptions and watch the images appear. When you decide to select one, click on the little arrow under the image. Once you have the image on your page, you can resize it. Remember these rules. When you click on the image, you will see little boxes show up to tell you the image is selected. Those boxes are called "handles." If you drag the handles from any corner directly toward the middle, the image will become smaller and keep the same proportions (See #1). If you drag the handles along any of the sides, you can distort the picture (See # 2 and 3). Change the image you chose until you feel comfortable with the process. Practice bringing other images and changing them around. Have fun. Change the font, color and size of the your title and practice what you have learned. Once you have the title and the image on your page, decide how far down the page you want your title. If you want it down the page, click the beginning of the tile and press ENTER on your keyboard. Practice until you are happy with the placement. If you decide you want the tile further up again, place your cursor at the beginning of the title. Press the <- BACKSPACE key until you get it where you want. Now your title page is complete. The last step in the process is to save your work. Actually, you should save your page immediately after you open it and several times after that! At the bottom of the window, type in the name of your document. Keep the name short and simple but descriptive. Avoid long file names, use only lowercase letters and do not include spaces. I called my file "myjournal." The words following the period in the file name show you the type of document you saved. Word documents are described as .doc. The program will automatically enter the dot and the extension (doc) for you. Now go the the RUBRICS page and evaluate yourself! When you finish, save your work. Congratulations! You have completed your task!